Two armed thieves pushed into the [shop] of the rice dealer Senzo in Shiba Saiojicho and spoke -- You must give us your money. Senzo was very frightened, but his wife Osato, since when looking at the robber [who spoke] [she saw that he] was a smaller man than she had thought, instantly disdained him, and took some rice bags that happened to be there and hurled one after another at him. Her left arm received some injuries but she fought without bending [yielding], and her husband Senzo, to protect his wife, wrestled with the robber and husband and wife finally wrestled him down and called called out -- Someone come! -- and some patrolmen who happened to hear this voice [cry] came running and pulled [the robber] to the station house. As for the robber, [he was] someone called Matsukichi. [As of] now, as for one thief, [he] feared Osato's power [vigor], fled and disappeared. This is one of several news nishikie that celebrate the courage and fighting spirit of women. armed thieves reflects 強盗 (gōtō), which therefore means (because it defines) "robbers". The term is also used to designate the act of armed theft or robbery. Shiba Saiojicho (芝西寺町 Shiba Saioōjichō) is now part of Shiba 2-chome in Minato ward in Tokyo. rice bags reflects 米俵 (komedawara). 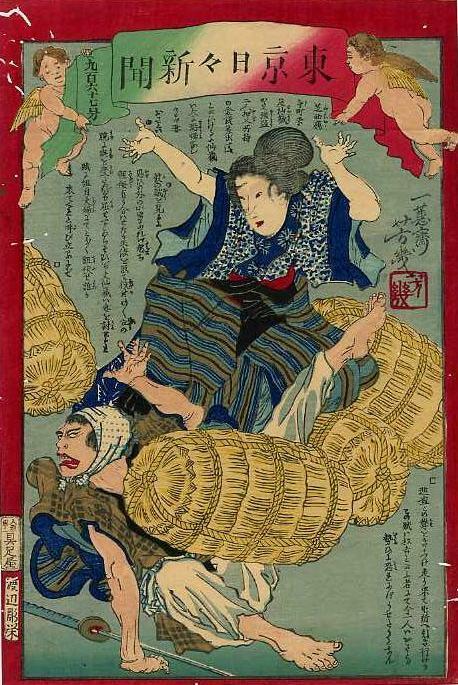 The bags that Osato is shown to be throwing appear to be of a standard size that probably weighed at least 50 kilograms. 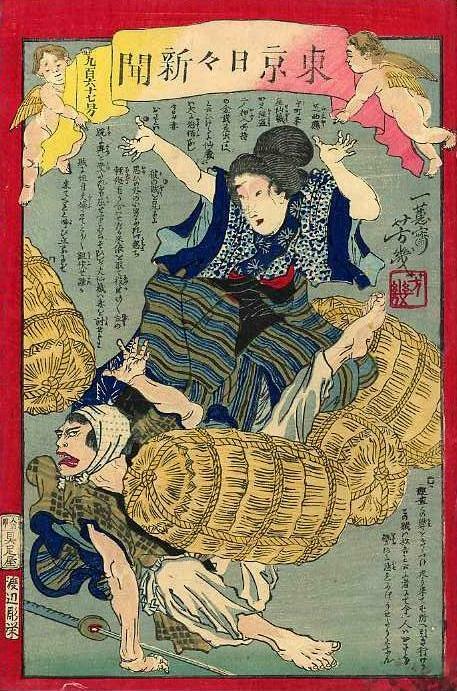 Though taxes and stipends were collected and paid in units of 1 koku (石), which typically consisted of two bags (俵 hyō), the amount of rice in one bag varied somewhat with period and place. Toward the end of the Meiji period, 1 bag was standardized at 4 to (斗) or 60 kilograms. station house reflects 屯所 (tonsho), an early Meiji term for a place where police were stationed and quartered.